Lance came through with this one and gave me a copy of a Sports Illustrated autographed by none other than Keyshawn Johnson. I am neither a fan of EBay purchases or autographed magazines, but I won’t look this gift horse in the mouth. At the time he also gave me a certified Billy Sims autographed card as well. I always give extras whenever I can to friends in a pay it forward maneuver, so it’s always nice to get something back in return. Keshawn Johnson came off the board #1 overall (first time since Irving Fryar, 1987) in the wide receiver deep 1996 draft. 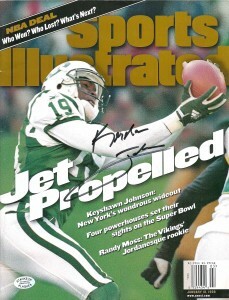 Selected by the New York Jets, Johnson recorded his first two 1,000+ yard seasons in 1998 and 1999, earning him ProBowl berths in both years. He’d be traded to the Tampa Bay Buccaneers in 2000, and have the best season of his career in 2001, when he posted 106 receptions for 1266 yards, earning his 3rd and final Pro Bowl berth. Keshawn posted his last 1,000 yard season and won the Super Bowl in 2002. He was traded to the Cowboys in 2004, narrowly missing the 1,000 yard mark at the end of the year. Johnson played one final season in 2006 with the Panthers, retiring after the season. Post playing days, Keshawn has been an in studio analyst and was the first celebrity voted out of Dancing With the Stars -17th Season.